RIO DE JANEIEO, BRAZIL – In a city where religion plays an important role in the daily lives of many, not only does Easter (Páscoa in Portuguese) represent a significant biblical event, it also offers the opportunity for a long and restful weekend combined with a copious amount of chocolate eggs. Luckily there are plenty of options to get involved in the holiday celebrations for those in Rio spending Easter away from home. Few things say Easter like chocolate eggs, photo by Lotus Head/Wikimedia Creative Commons License. Once again, The American Society of Rio de Janeiro (AmSoc Rio) will be holding their annual children’s Easter Egg Hunt at the American School in Barra da Tijuca on Saturday, April 7th, at 10:30 AM. Children can join in the activities which also include pin the tail on the bunny, egg toss and much more. A small entrance fee for members is R$10 for adults accompanying children, and just R$15 for non-members, and those interested in transportation should contact AmSoc Rio. It goes without saying that youngsters all over the world are looking forward to Easter weekend but perhaps few as much as those at the Casa do Caminho Orphanage in Xerem, just over an hour north of the city. Volunteers at the orphanage have planned a special Easter trip to Rio on Saturday, April 7th where children will spend the day frolicking on the beach and hunting for chocolate eggs hidden in the Caso do Caminho Language Centre in Ipanema. 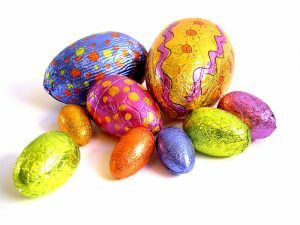 Volunteers from the orphanage are asking for donations of chocolate Easter eggs in time for the big hunt on Saturday and are inviting anyone who wishes to join in the fun to bring along a dish of food for a buffet style meal in the evening. Those planning to donate eggs can leave them at the Casa do Caminho Language Centre on Rua Farme de Moeda, 135. With so many people simply looking forward to the opportunity of indulgence, especially after lent, it is important for others to honor the religious significance of Easter. The Union Church in Barra da Tijuca will commemorate the event on Sunday, April 8th, with a pancake breakfast starting at 8:30 AM followed by an Easter service at 10AM. After the service, children can take part in an Easter egg hunt, have their faces painted after which a buffet lunch will be served to finish off the morning. Over in Zona Sul (South Zone) the Christ Church, Rio’s only Anglican center of worship, situated in Botafogo is performing a special Easter ceremony which begins with a bilingual service on Friday, April 6th and concludes Easter weekend with a Sunday communion on the April 8th at 8AM. Also, those just looking for a good meal and some fun Easter decorations, the Gringo Cafe in Ipanema is celebrating all weekend with special chocolate treats, as well as a new Eggs Benedict dish introduced just in time for the holiday. I heartily wish you and other readers of the Rio Times a Happy Easter. However, along with myself, I would like to believe that some of your readers celebrate Passover as do my Carioca cousins in Copacabana, Gavea, Barra da Tijuca and Laranjeiras. Coverage of our celebrations would also be appreciated in your coverage. Shalom and a Zeesin Pesach (Sweet Passover) to family and friends in Rio. Yes, Brazil is truely a country where all religions can celebate!